I know I missed last Friday and haven't posted since. Blog will be resuming soon...I promise. I've just been working a lot. This post is about Nikki of LuxieLou Designs. I first met her on Flickr via the 365Project. By the time I started Nikki was actually going through her SECOND 365 with Quinne's twin, Rylee. I always liked her photos and followed the girls' adventures. Nikki has an etsy shop and recently did an interview with Michelle on Blythelife.com. 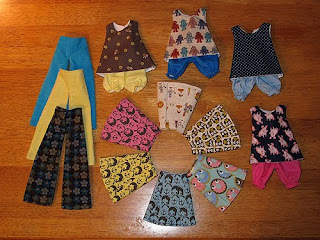 The interview is a great read, and Nikki makes the cutest little Blythe sets and skirts. To check out the interview, visit BlytheLife Also, take a look at Nikki's fashions, Luxie Lou Designs.